Defunct Audio Manufacturers - Vi - audiotools.com. Originally founded in 1936 as Székesfehérvári Vadásztölténygyár and is based in the town of Székesfehérvár (Szfvár/Stuhlweißenburg) in Fejér county, which is located in central Hungary, south-west of the capital city of Budapest. Initially operated as a metal workshop and manufacturer of ammunition for both private and armed forces usage and the name translates into something like "The Szfvár Gun Cartridge Factory" or simply "The Szfvár Ammunition Factory". Incorporated in 1938 as Vadásztöltény csappantyú, gyutacs és fémárugyár Rt. and was by then making military electronics, weapon subassemblies and other metal parts primarily for armed forces usage, with their biggest client being the Wehrmacht (German army) and to a lesser degree the Hungarian armed forces. Started acting as a subcontractor for American and European computer manufacturers in the 60's but when the COCOM rules were introduced they moved into making consumer products both as an OEM and as a contract manufacturer for a number of European and Asian firms although their loudspeakers and car audio products where for a time sold under their own brand in the west, these were exceptionally good value in the 1970's and 80's and thus did quite well for a time in particular the loudspeakers. 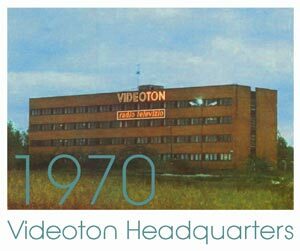 In the English speaking countries were sometimes marketed anglicised as Videotone although the speakers themselves remained marked Videoton. 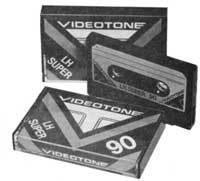 Cassettes sold in the early 80's by the British importer Videotone Limited which was based in Crofton Park in London. These were offered under the localised Videotone brand. The cassettes were actually not made by Videoton but rather made by a West-European OEM specifically for the British importer. Despite being bargain priced and somewhat cheaper in the UK than the original brand products they did not sell well as people perceived them to be East-European despite them actually being North-European. Videotone Ltd. operated into the early 1990's. The company started manufacturing for Akai Electric Co. in 1979 and was the source of most of the Akai loudspeaker products sold in Europe during the 80's, and in addition did rather well in that decade under its own brand, particularly in Eastern Europe. However the fall of the communist governments in Central Europe led the company to lose its primary markets for CE products which in turn lead to the company being privatised in 1991 under the name of Videoton Rendszertechnika Ltd and sold to the a consortium consisting of the Hungarian Credit Bank (70%), Euroinvest (20%) and local computer firm M?szertechnika Holding (10%). In 1996 the managers of M?szertechnika, namely Széles Gábor, Lakatos Péter and Sinkó Ottó (note: Hungarian names) took over the company in a leveraged buyout and run the company to this day. Austian enginner Friedrich Horny begun manufacturing radios in Wien in 1923 under his own name, he incorporated his company in 1924 as Vindbona Radio and manufactured radios under the Horny brand, in addition to making passive and active electronic components. The company became the leading producer of brown goods in Austria almost from the word go and held a number of patents both locally and internationally, the company registered the brandname Hornyphon in 1927 and used that name on their products thereafter. At a similar time the company entered into a deal with the Dutch giant Philips whereby Vindobona stopped the manufacture of valves and bought them instead from Philips which in return licensed some of their patents, in the following years the company undertook an ambitious expansion plan that stretched their financial capacity to the limits and in 1936 the company went bankrupt, but bounced back almost immediately as Radiowerk Horny under the ownership of Philips. A manufacturer of high end cables and interconnects based in Barred, Alberta, Canada and run by Rick Schultz. It was one of the first high end audio cable producers to try to market their wares directly to the punter, but normally cables and accessories are the audio product that require most dealer sales support. Mr. Schultz started out in late 2000 or 2001 by selling cables on the Audiogon site under the Dr Audio name, in 2002 he started selling them on his website under the VD name. The company announced in December 2009 that they would be closed during the latter half of the month since they were moving their premises and would open up again in the middle of January 2010 and at the same time advertised for a more or less a complete new sales and manufacturing team. In February 2010 an announcement appeared on their site that they were closed for good. Virtual Dynamics landed something of a marketing own goal in 2008 when someone's power cord came apart and he posted pictures of it on the internet (see link below), but the company's site usually listed suggested retail prices of 3x what they actually charged, in this case the cable sold for USD99 but was listed on the site as having a MSRP of 299USD which may have sounded like a good idea at the time. The fairly inexpensive construction of the cable along with an overinflated MSRP meant that people looked at it as a scam, in actuality the construction of the cable was in pretty much in line with a USD 50 to 75 power cable and would if the real retail price have been shown not been anything outrageous, with with the claim that this it was a 300 USD cable things started to sound a bit fishy. The story and the pictures of the cable spread far and wide on the blogosphere in 2008 but it is not known if this had anything to do with the demise of the company. Other resources : The company's Youtube Channel -- Orginally had no less than 77 videos uploaded by the company, but in late 2011/early 2012 all the sales and "evagelisation" videos were removed from the channel, leaving only 22. Rick Schultz's Youtube channel -- The former VD CEO's Youtube channel, with some 20 odd videos mostly on Virtual Dynamics. USA based maker of budget hi-fi products. Went bankrupt in 1977. Although this was run as a separate company it was actually a project run by Nelson Pass of Pass Labs along with some financial backers, founded in 2000 in an attempt to break into a more cost conscious market with an upgraded line of their Aleph single ended transistor amplifiers that Pass labs had discontinued in the 1990's, but provided them in a more inexpensive housing thus maintaining a lower price point than what the original product archived. Not a success and the company discontinued the line in February 2002. Founded in 1888 by Charles Sumner Tainter and Alexander Graham Bell to manufacture the Graphophone (now better known as the Dictaphone). British manufacturer of open reel tape recorders and related products such as mixers etc., believed to have been started up in the late 1940's although that is not for certain but was taken over by Clarke & Smith (S.T.D.) in the early 70's after the passing of its founder. British turntable manufacturer founded in 1985 and run by engineer Guy Adams, also sold a number of turntable related upgrades for third party decks such as power supplies etc. The company's main claim to fame was the original Voyd turntable but it was the first British table to use multipile motors, and 3 Pabst Aussenlaufer at that, but unlike its mainland European counterparts the Voyd featured a suspended subchassis. The company was bought by Audio Note UK Ltd. sometime in the latter half of the 1990's and the original Voyd designs live on as the Audio Note UK TT-3 series. Voyd's former proprietor is now working for Hewlett Packard no service is provided for older products from the company except that ANUK can provide you with spares for certain models..